Southern Fried Scientist decided to feature a week of surreal science related to the oceans. I take this opportunity to be a lazy blogger and repost this piece (slightly rewritten) from May 2008. 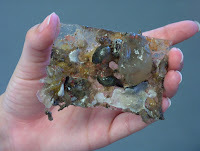 Adult sea squirts (also known as tunicates or ascidians) are sessile animals. As adults, they really don't move. But if anyone has heard about sea squirts, they’ve probably hear that little sea squirts start life as smart little tadpoles, searching this way and that for a place to land. Once they’ve found the place where they'll spend the rest of their lives, they go through a metamorphosis into the immobile adult. But as they have no further need of their brain, they eat it.